One difficulty in teaching biology was explaining the history of Earth. 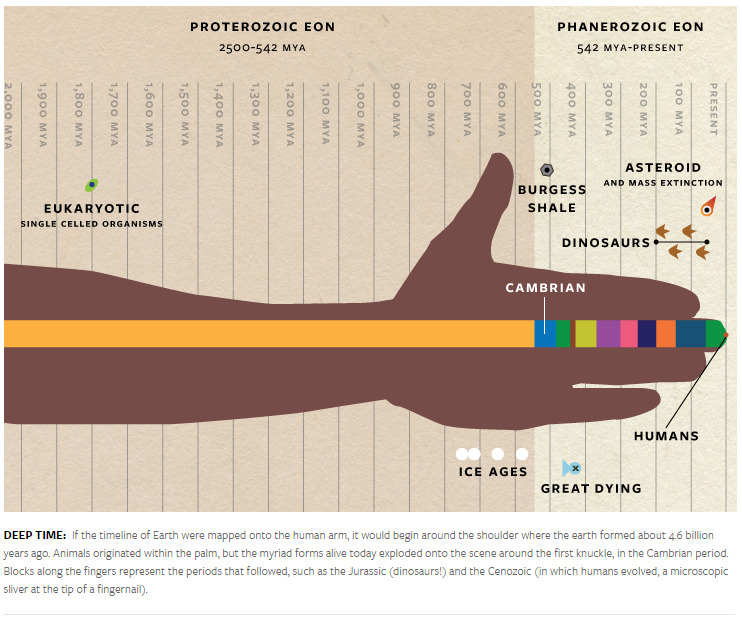 How do you effectively show 4.6 billion years to 15-year-olds? I have used timelines, football fields, and even a piano to represent deep time. There was a great TED talk on the subject as well. I think that I like this one the best. The details would be hard to show, but everyone would understand it. Just use your arm! It would be like a built in cheat sheet. Everyone can bring their arm to the test. I don't know if it would work, but it is an interesting way to think about time. The Universe is conspiring to kill you. You body is under constant attack. But most days, you don't die. You don't even get sick. This is thanks to your enormously complex immune system. Full of B cells, T cells and antibodies, your immune system fights off invading armies of bacteria and viruses. This video by Kurzgesagt explains the basics of keeping you alive. I could have used this during PY1. In 1986, the rock band Queen asked a simple question, "Who wants to live forever?" Everyone has asked that question, and Dr. Elizabeth Blackburn and her team won a Noble Prize in pursuit of that discovery. They found an answer the the biological cause of aging: telomeres. Jalees Rehman wrote an extensive piece on the topic on SciAm's blog page. Not long after the discovery of telomeres and their enzyme, telomerase, people began dreaming of a magical elixir of life to reverse aging. Aging is, unfortunately, a very natural process. As cells live, they because damaged due to various forms of stress and attack. To survive, they must reproduce to make more cells. This requires the replication of the genome. DNA synthesis splits open the double helix and copies the unpaired nucleotides to produce an identical strand. Well, almost identical. The ends of the chromosomes get a little bit difficult and some parts of the ends don't get copied. The best analogy is the ends of a string. The ends fray the longer it gets used. So how do you protect the ends? Shoe laces have plastic covers called aglets, and your DNA has a telomere. The telomere is noncoding DNA at the end of a chromosome. A little bit of the telomere frays away every time the cell divides. This determines the lifespan of the cell. Once the telomere erodes away, important coding genes become damaged and the cell must die. The accumulation of this type of death is called aging. Dr. Blackburn learned that a sample of DNA can provide enough information to learn about a person's health. People with longer telomeres were biologically younger, even if not chronologically. Those with short telomeres were three times more likely to have cancer. Cancer cells have activated telomerase that repairs the vanishing telomeres producing a cell that never dies. Cancers cause problems because they have too much telomerase. Every cell has telomeres, but not every cell has telomerase. This is so that cells can naturally die out of the way, but cancer messes that system up. So having too little telomeres can cause the problems of aging. Too much telomerase can cause the problems of cancer. Then the healthiest has to be right in the middle. So their might not be a magic potion to reverse aging and rebuild our telomeres. At least not without significant risks. Instead, have have to protect the telomeres we have. Reduce the stress we put on our cells and let them live out their full potential. You won't live forever, but you might make it a long time. Besides, who wants to live forever? 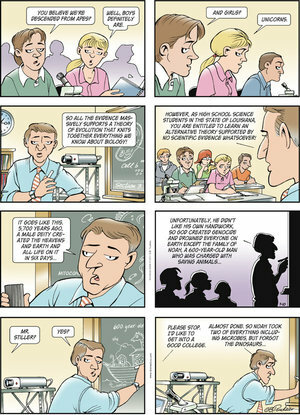 As a former science teacher, this sounds about right. Most of the activities students do in class follow the very basic, structured Scientific Method. 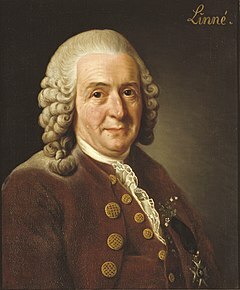 You know: Observation, Hypothesis, Experiment, Data Collection, and Conclusion. Classroom labs generally involve an experiment that has been done millions of times and the procedure carefully typed into a word document. Typically, the idea is to emphasize the main point of a lecture like finding the density of an irregularly shaped object. These "Science Experiments" come sterilized and prepackaged. No really, you can buy a lab in a box that comes with everything you need including the student worksheets and answer keys. Rarely, do students get to actually participate in science. Probably because it is messy, complicated, and can't be finished in a 90-minute period. 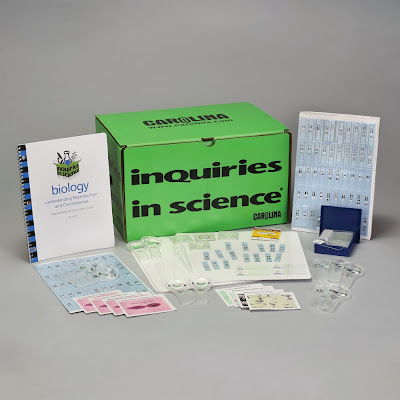 State curriculums and tests drive the science classroom to prevent the exploration of good science for students. I posted this before, but blogger had a hiccup and erased the article. Creationists often say that teachers should teach both sides of the Evolution-Creation debate. They continue this ploy as if a scientific consensus hasn't been reached. They also pretend that no other scientific idea doesn't have a controversial alternative. I suggest that if the poorly named "Academic Freedom Bills" pass in a state near you, embrace the sentiment and teach these alternative theories. 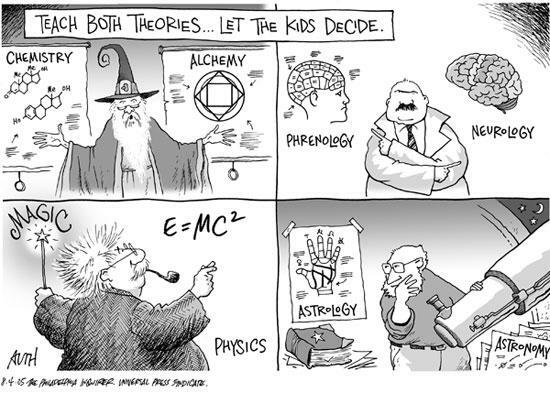 Let your kids decide which makes more sense: Alchemy or Chemistry; Neurology or Phrenology, Astronomy or Astrology; Physics or Magic. While your are at it, teach the kids why intelligent design fails as science. If they want you to teach the controversy, explain why no controversy actually exists. Give them the accurate information and let the kids decide. Commander Chris Hadfield did something amazing. He recently returned from the International Space Station. While there, he made a video blog and answered questions from kids about science in space. I am sure we will see him in the future. As his time on the ISS came to an end, he took some amazing Hi-Res photos of Earth. 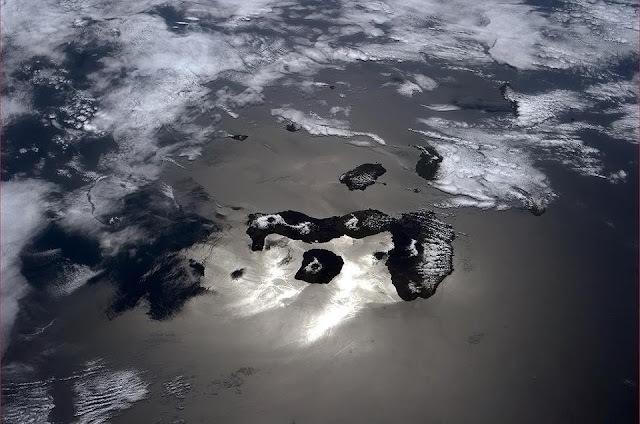 This one is probably my favorite - The Galapagos Islands. Not really going to say much more about it. And I will just leave this right here. Here's a simple experiment on a large scale. Take an empty 5-gallon water jug. Coat the inside with ethanol. Pour out excess. Light a match on a stick. Hold flame over the mouth of the jug. WHOOOOOSH! This is a great experiment for Combustion Reactions. Coating the inside of the jar with ethanol removes the oxygen from the system. Without oxygen, you can't light the fumes. Except for the fumes escaping from the mouth of the bottle. The oxygen and ethanol combust as the oxygen is sucked into the bottle creating the Whoosh sound. 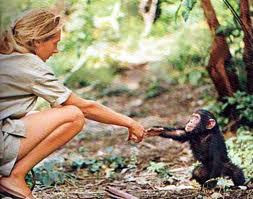 Jane Goodall spent months living near the chimpanzees in the Gombe National Park of Tanzania. She went slowly and eventually the chimps began to trust the long-haired pink primate. While she may not have followed strict scientific protocols in her studies, Goodall's observations humanized our nearest cousins. She changed the way we think of the chimpanzees, and the way we think about ourselves. This image in particular shows that link between humans and chimpanzees. Curiosity and trust shows on both of their faces. Two distant cousins meeting for the first time. Just amazing. Speaking of Goldenrod Paper. I forgot that I had tried to make a GIF of the process. We were doing something in class for them to make animations, and I wanted to try a GIF maker on my iPhone. As you can tell, this particular message has be read so many times that the words kind of show up at the beginning. When you first do it, no one can see it - especially from across the room. I need a little bit more practice with my GIF making, but I think it is a good start! The best thing about teaching high school chemistry is the incredible stockpile of chemicals. Many are harmless, but some can be incredibly dangerous. Only one of those categories will grab be attention of the students. Partly from boredom, but mostly to interest the kids, I began doing weekly "Moments of Science" every Wednesday. At the beginning of class, I would set up some crazy demonstration. Most of the time, I could work the demonstration into our unit. Other times, it was just to show something that I found cool. The kids really loved it and would remind me whenever Wednesday came around. I had a good time with them as well. I don't have any pictures or videos of me doing them. I wish I did. But I can always find them on the You-Tube. Here I will tell you how to do it. Some of them (the more dangerous ones) you could only really do at a school, but some you can easily do with homemade materials. I hope you enjoy them. I begin with demonstration I did on the first day of school every year: Golden Rod Paper. Goldenrod paper contains a certain dye that acts as a base indicator. Ammonia causes the yellow paper to turn "blood" red. I begin by talking about blood donations, needles and the need for blood to help people as I put my hand in an unknown fluid. As my hand is in the liquid, I say my pores are opening and blood vessles are dilating and that my hand is tingling. Then I suddenly slap the yellow paper leaving a blood stain the shape of my hand. Most of the kids freak out believing it to really be my blood. The ones who don't believe it, think that it is just water. So I put some water on a Q-tip and nothing happens. Eventually I tell them that it is ammonia and how bases can change the colors of things called indicators. Water, which is neutral, doesn't change the color. I also ask them what would happen if I put an acid on the paper like vinegar. It will go back to yellow. You can also write hidden messages in wax or tape which are revealed by a spray bottle of Ammonia. I found a golden rod crayon and wrote "Science is Awesome" then sprayed it with the ammonia. The best part is the evaporation of ammonia which leaves allows the paper to return to its original color. There are a lot of science topics that you can talk about this just this one demonstration. It's safe, fairly clean, and you can do it at home if you find the right materials. Enjoy! 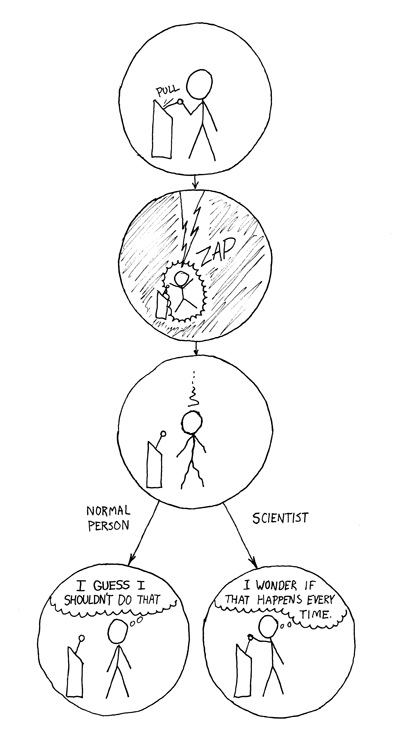 Explaining science is difficult. Most people don't understand basic science, so it is even harder to explain the important details of complex systems. Take any controversial topic. People are legitimately confused about evolution and climate change despite the overwhelming scientific consensus and support. Scientific training spends all of its time diving into minute details about complicated topics, and leaves little to teaching scientists to talk to the public. We have some very good science journalists who mediate between the general population and dense journals. We have some very good teachers who can relate these topics as well. But we do need the actually scientists to be more visible and more vocal. Science Fellows Intro from PopTech on Vimeo. Quick video asking random scientists random questions. It is funny watching them to struggle with the answers. We typically think about scientists as know-it-alls, but while they will be intelligent they tend to specialize in narrow categories. So here are some questions for them to answer outside their realm of of their expertise! See how many you can answer and enjoy! It is summer. It is hot. And it is time for sunburns. In my classes, I talk a lot about skin (anatomy and biology) and about UV rays (physics). This infographic from David McCandless and Information is Beautiful sums up what anyone should know about sunscreen. It is important information, especially for me who has skin so white it almost shimmers in the sunlight. The picture is quite long, but you will not be disappointed when you get to the end. Enjoy! This Doonsbury comic strip blew up on the blogosphere yesterday. It is accurate and it is poignant. The Louisiana legislature wants this situation to happen in their classrooms with their horrible and ironicly-named "academic freedom" bill. To be sure, as creationists pack school boards around the country, they prefer science teachers to stick to a literal reading of Genesis. If I were stuck in this position, I would teach Intelligent Design from the scientific point of view. I would show why ID fails as science. Enough with the commentary. Enjoy the comic! I really liked this comic. Scientists look at the world differently from everyone else. This comic sums it up beautifully. Remember: Results must be replicated!!! Baba Brinkman has put together an album called The Rap Guide to Evolution. He produced 16 songs which are pretty guide. I will post one track called Natural Selection which will actually roll through the whole album. To hear the rest, you can follow this link.